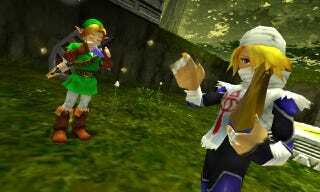 In building the 3D remake of The Legend of Zelda: Ocarina of Time, the mandate for the developer Grezzo was to preserve fans' memories of the original as much as possible. That meant, where possible, that bugs from the original Nintendo 64 game were intentionally left in. "As programmers, we wanted to get rid of bugs," Grezzo's Shun Moriya said in the latest Iwata Asks roundtable discussion with the Nintendo president, "But the staff members who had played the old game said the bugs were fun! "It wouldn't be fun if your friends couldn't say, 'Do you know about this?' So we left them in if they didn't cause any trouble and were beneficial," Moriya added. Iwata asked if Grezzo "implemented them as you would specs, rather than treating them like bugs." Yes, Moriya said. "If something simply could not be allowed to stand, we begrudgingly fixed it, so some bugs don't appear," he said. "But we left in as many as we could, so people will grin over that."